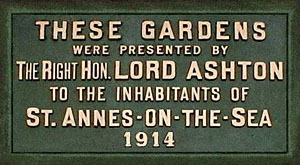 Ashton Gardens was bought for the people by a huge donation from Lord Ashton in 1914. Since that time the local Council has managed and maintained them. But recent times have seen strong pressures on Council budgets. Renovation and renewal is increasingly difficult to fund, and plans for residential or commercial development continue to threaten the Gardens. SOAG aims to work with the Council to ensure the future of the gardens and all their features. Sometimes we need to lobby our Councillors, or to raise funds for projects, or to speak out in public. Help to make your views known, and help to protect the Gardens for future generations. Provide essential funding that will help to ensure the future wellbeing of the Gardens. Contribute your own special skills. Join a community that cares about its people and its environment. Membership is open to anyone, worldwide. As a small voluntary organisation we regret that do not have online payment available, so to join, you will need to send a cheque or postal order for the membership cost, together with your name, address & postcode, and phone number. You also need to say which type of membership you require. If you have an email address, please let us know. We welcome donations to help in our cause. No amount is too small or too big. Copyright © 2012 Fred Moor.